Stainless steel casting is the special steel casting type used primarily because of their corrosion resistance. All stainless steels casting grades contain a minimum percentage of 10.5% chromium. Chromium is always the deciding factor, although other elements, particularly nickel and molybdenum, are added to improve corrosion resistance of stainless steel casting components. The success of the material is based on the fact that it has one unique advantage. The chromium in the stainless steel has a great affinity for oxygen, and will form a film of chromium oxide on the surface of the component. In many cases, stainless steel casting is the most cost efficient solution for metal components used in food machinery, display, oilfield industry, and other applications. 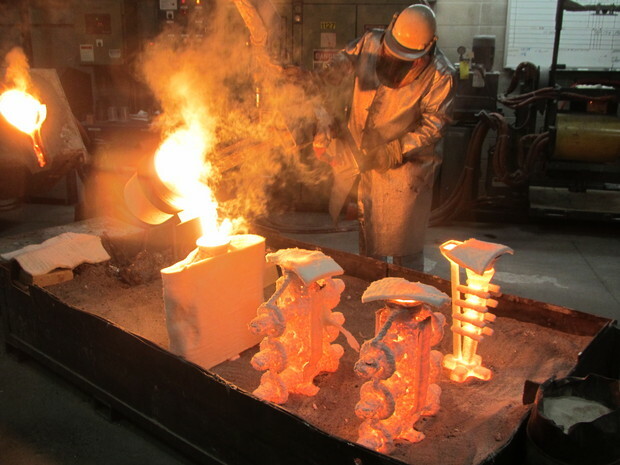 Although producing a casting component in stainless steel will often be more expensive than other steel castings due to the higher cost of stainless steel and expertise required during stainless steel casting process. But Stainless steel castings can give the advantages of longer service life and less maintenance costs for equipment. There are several types of stainless steel castings: Austenitic Stainless Steel Casting, Ferritic Stainless Steel Casting, Martensitic Stainless Steel Casting, and Duplex Stainless Steel Casting. These types of stainless steel castings are named from the crystal structure of the steels, which determines their metallurgical behaviour. Austenitic stainless steel castings are non-magnetic. When nickel is added to stainless steel in sufficient amounts the crystal structure changes to “austenite”. The basic composition of austenitic stainless steel casting grade is 18% chromium and 8% nickel. This enhances their corrosion resistance and modifies the structure from ferritic to austenitic. Austenitic stainless steel casting grades are the most commonly used stainless steels casting material accounting for more than 70% of production (type 304 is the most commonly specified stainless steel casting grade by far). They are not hardenable by heat treatment. Ferritic stainless steel casting are plain chromium stainless steel casting process with a chromium content varying between 10.5 and 18% and a low carbon content. They are magnetic and not hardenable by heat treatment. Ferritic stainless steel casting grades have good ductility and formability but a relatively poor high temperature strength compared to that of austenitic grades. Martensitic stainless steel casting were the first stainless steel casting type that were commercially developed and have a relatively high carbon content (0.1 – 1.2%) compared to other stainless steel casting types. Martensitic stainless steel casting contains chromium between 12 and 18%. They are magnetic and hardenable by quenching and tempering like plain carbon steels and find their main application in cutlery, aerospace and general engineering. These are stainless steels containing relatively high chromium levels (between 18 and 28%) and moderate amounts of nickel (between 4.5 and 8%). The high corrosion resistance and the excellent mechanical properties combination of duplex stainless steels can be explained by their chemical composition and balanced (‘duplex’) microstructure of approximately equivalent volume fractions of ferrite and austenite.